Break out the balloons and streamers and grab your most blood-proof clothing, it’s time for 2017 Miss Cryptid Contest! The first week of this year’s fang-packed Miss Cryptid contest takes us around the world from the Monkey Man of New Delhi to the Wampus Cat of America to the Grootslang of South Africa. A trio of dangerous denizens await your ogling! Who will capture your heart this week? Make sure to cast your vote on our Home page and enter your email for a chance to win a prize pack from Blurry Photos. That includes a Golden Goatman replica of your very own! 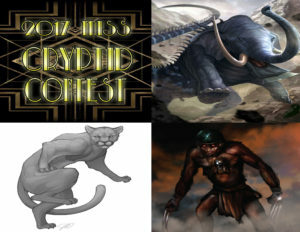 Enjoy the first week on our journey to crown the next champion of our annual cryptid combat. Thanks to listener Screwdriver Key for the Wampus Cat art!